Something I constantly return to in my criticism of games, movies or TV I’ve written or recorded, is the weight I place on sound design above any other aesthetic value. I think it’s because sound carves a much more direct route to the primal, emotional part of my mind. Of course visuals will tap into that as well, but it’s easier for me to break down my reaction into its component parts. Is the composition drawing my eye in a certain way? Is the use of colour affecting the mood? Sight is a sense much more grounded in logic in my experience. This will be different for different people of course. For some, sight will be the more primal sense. However, it felt important to ground what I’m about to write in my own personal context. I hear the wail of the Combine Gunships from Half-Life 2 in my dreams. Sometimes, even when I let my mind drift off and catch whatever thought happens to float by. Kelly Bailey is one of my favourite sound designers anyway, with his name being attached to some great audio in games in the past, but I think this organism is his masterpiece. One of its key successes, is that it perfectly evokes what the Gunship is and why that’s a horrifying concept. If you don’t have any familiarity with Half-Life lore, I’m not going to give you a full catch up, however it is important to understand that many of the enemies that make up the Combine (the primary antagonistic force in Half-Life 2 and its episodes) are assimilated creatures from other worlds that over time have been modified to be more and more cybernetic in nature. 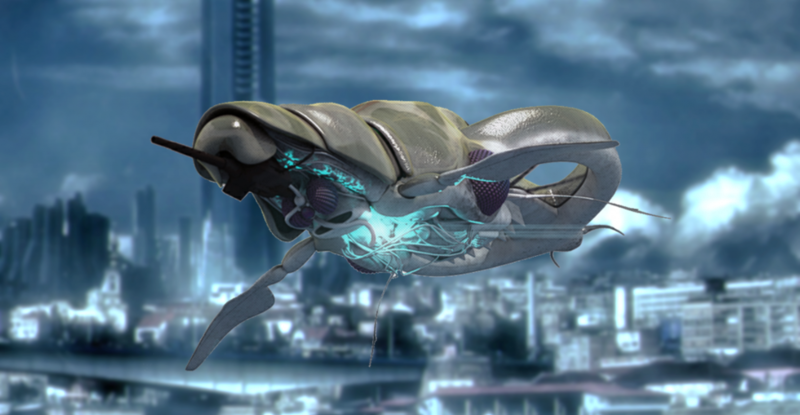 The oldest members of this military force look almost entirely mechanical, with a few key characteristics indicating their organic origins. First, lip-service needs to be paid to visual design of the Gunships, as the sound design almost certainly uses it as a jumping off point. It looks very similar to an ancient whale, with the fluke replaced with helicopter blades and its lower jaw with a powerful machine gun. It even animates the way an inquisitive dolphin might inspect you through a pane of glass, as it seeks to gun you down. Below is a comparison image between it and a Basilosaurus as depicted in the BBC series, Walking with Beasts. It’s a beautiful marine creature, mutilated and corrupted by the machine of war. Rather than choosing to use sound to depict these two halves of the Gunship’s nature being in harmony, Bailey instead depicts them as being in conflict. The mechanical and soulless audio of the helicopter blades and the occasional computerised “BARP” it makes are interrupted by what I can only describe as a marine mammal crying out in pain. At first I thought this was a noise it only made when struck by a rocket. But, in fact it makes similar cries when simply… existing. The sound adds a whole new horrible dimension to the Gunship that the lore and visuals don’t convey. Intentionally or not, it planted the idea that this creature is fully conscious, but has no free will. I felt it was trapped beneath a cybernetic cage that it couldn’t escape or resist against. A passive observer inside a body, used to deal out death. Now, there is no supporting evidence for this anywhere, and frankly I would never want this to be confirmed or denied. But you know, ‘Death of the Author’ and all that. What your audience can interpret from your art can be just as powerful and important as what you intended, and the layers that the sound design added to my interpretation of the Gunship is horrifying in the best possible way. When I think about why I love Half-Life 2 so much, the Combine Gunship is always at the forefront of my mind. It’s a symbol of the aesthetic ethos of that game, and a testament of how great sound can be used not only to give the player mechanical information, but to also evoke a primal emotional reaction and add new layers of horror to something already horrific. I also love the gunship, and HL2 as a whole, of course. What a terrific game. Those are not crying sounds, but alert and emotion sounds like anger, the sounds have names on the game files, that’s how i know though..
That’s right – the word ‘cry’ in the title here refers to cries of anger, aggression and other emotions, not that the gunship is blubbing like a baby! I was thinking about the gunship for the last two days since I decided to play through the HL saga again. I’ve always imagined it as a huge marine creature converted into a flying machine as well. Steering in the air is pretty similar to move in the water isn’t it? Alwys tried to shoot it down when it was close to reachable grounds(highway) so it wouldn’t shatter into pieces but stay intact to be able to observe it’s features. Anyway great article, I like the trapped mind concept… even striders have actual brains as seen in ep2.